Let it be spring! 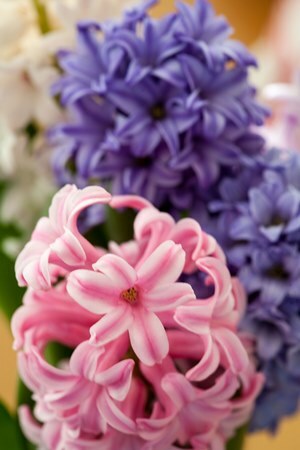 Nowruz, or “new day” in Persian, falls on the spring equinox and is celebrated for the thirteen following days. This year it fell on March 20th, and now we’re in the Persian year of 1393. While Nowruz is a major festival in Iran, the holiday is also celebrated in other countries, where ancient Persian culture left its mark, such as Azerbaijan, Afghanistan, Albania, India, and Turkey. The festivities came into our family with my Azeri stepmother, and along with Easter, Nowruz is one of my favorite holidays for its rich symbolism of renewal and hope. It’s also a reminder that winter’s grasp is weakening and that warm days are around the corner. In every home, the centerpiece of Nowruz celebrations would be a table decorated with seven items, haftseen or the seven S’s. Seven is considered a lucky number, and each item on the table beginning with the letter seen (s) in Persian has its unique meaning. For instance, seeb (apple) represents beauty, seer (garlic)–good health, serkeh (vinegar)–patience, and sekeh (coins)–prosperity. The arrangement is ornate and colorful, and people make rounds admiring each other’s haftseen tables, sharing good wishes and delicious food. The mouthwatering delicacies prepared during this time are one of the reasons why I am always keen to partake in the celebrations. We would enjoy meat stews with herbs and spices, cakes filled with walnuts and cardamom, and buttery pilafs. This year my Nowruz celebrations were relatively modest. From the haftseen spread, I’ve kept Sonbol (hyacinth) to represent spring, and out of the elaborate menu–a rose perfumed sherbet. 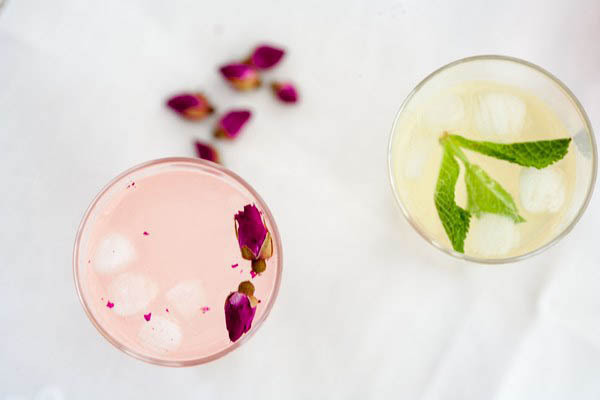 Persian sherbet, or sharbat, is a soft drink made with a flavored syrup mixed with water. Fruit, floral waters and spices are combined to make the syrup, and the interesting combinations are endless: rose and saffron, almond and orange blossom water, quince and lime, and bitter orange. When I was growing up in Ukraine, access to exotic foodstuffs was limited, so we used commonly available ingredients such as sour cherries, plums, and rhubarb for an equally delicious result. 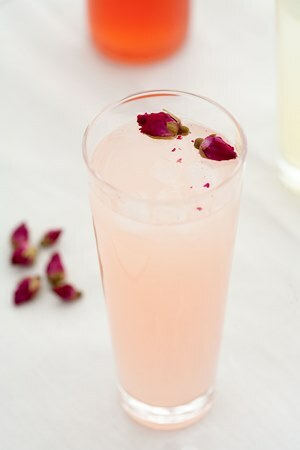 Rhubarb is a quintessential spring treat, and rhubarb sharbat tastes bright, tangy and floral. The latter nuance can be amplified with rose, which as you’ll discover, marries perfectly with any tart fruit. 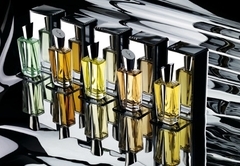 This is the same reason why many perfumers pair the two in their compositions. Just consider Hermès Rose Ikebana, Comme des Garçons Series 5 Sherbet: Rhubarb, Jo Malone White Lilac and Rhubarb, and Yves Saint Laurent Baby Doll. Or Guerlain Homme that blends the sharpness of rhubarb with a rose-like geranium for a sparkling, refreshing effect. Sherbets are easy to make–just boil the ingredients with sugar and strain. They keep well in the fridge, and you can make a selection of different syrups with seasonal fruit to enjoy throughout the year. The jewel colored syrups are also great for drizzling over cakes, crepes and ice cream. Diluted with water, they can be frozen and turned into granitas. But the simplest way is just to mix 1 part of syrup to 3 parts of water for a soft drink. Take a rose perfumed sip and will for the spring to arrive faster. You can also vary the syrup by substituting other flavorings, such as vanilla, orange blossom water or a couple of crushed cardamom pods. Cook spices with rhubarb in the beginning, but if you’re using vanilla extract or floral waters, add them at the very end. 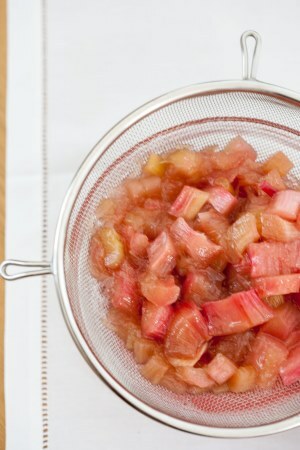 The color of your rhubarb will determine the hue of the finished syrup. You can also add a handful of strawberries or raspberries for a brighter pink color and a rich flavor. Sometimes sherbet is colored artificially, especially if the rhubarb is pale, but I would rather keep it all natural and enjoy the pale blush drink. Adding on: don’t throw away the strained fruit! It’s full of flavor and can be eaten as a sweet compote is with fresh cream and cookies. Or you can cook it down for 5 minutes to make a quick jam. 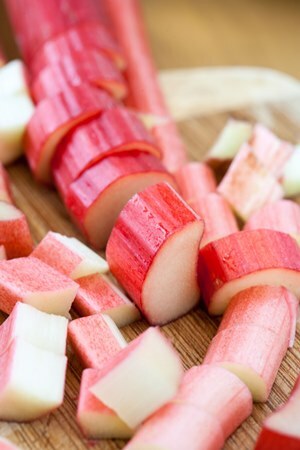 Chop rhubarb into medium sized pieces, cover with sugar and let macerate for 2 hours or overnight. Add water and simmer over medium fire for 15 minutes until the rhubarb starts falling apart. Remove from heat and strain through a fine-mesh colander. Put the syrup back on medium-low heat, cook for 5-10 minutes to concentrate the flavors. Add lemon juice. Skim any foam rising to the surface. Take off the heat. Add rosewater (or other flavorings of your choice, see the headnote) and chill. Stored in clean, sterilized bottles, the flavored syrup can last for several months in the refrigerator. To make the drink, mix 1 part of syrup to 3 parts of water, add ice and enjoy. Traditionally, sherbet is served very sweet, but I prefer more water and a lighter, brighter flavor and sometimes increase the proportion of water to 4 parts. Alessandra: I adore Nowruz but I still have to start celebrating it, somehow. I love this post!! Sandra: Looks amazing!!! I love Rhubarb and they usually sell it at the farmers market when it gets geared up. Right now the only thing I can find is root winter veggies. 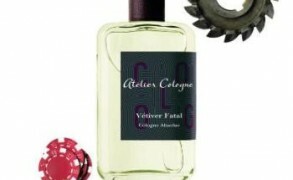 Victoria: La Chasse Aux Papillons is one of the best spring-like perfumes for me, and I also wear it to imagine spring. Now, in Belgium we don’t have much to complain about this year, because the winter has been mild and it feels very spring like right now. But I know that in the US, it’s been one long bitter winter, so I hope that the spring will finally arrive to your shores. Ashley Anstaett: Thank you for a post reminding us that spring is near! I’m going to the farmer’s market Saturday morning, so I’ll see if there’s any rhubarb, although it might still be just a tad bit early here. I will celebrate Nowruz just a little late, but what a wonderful thing to celebrate. Happy Nowruz, Victoria and everyone else! Victoria: I’m also thinking of planting saffron crocuses. It’s a bit late, but they usually grow very quickly. Gentiana: Thank you, this is a beautiful way to welcome the spring. I didn’t know about Nawruz, thank you for sharing your knowledge and impressions. Rhubarb sorbet sounds mouthwatering. And the photos you posted are equally uplifting and mouthwatering. You brought me again nice memories back. 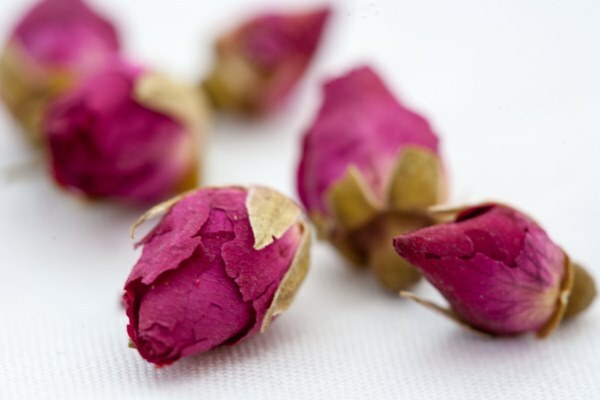 I used to get rose or raspberry “sherbet” in my childhood when visiting some nice, cultivated, elderly ladies. Sherbet was made mainly in the southern part of our country, where turkish traditions were strong. The sherbet they used to make (or what was called here as “sherbet”) is more a soft paste than a syrup, it is opaque and is put one big teaspoon of it in a glass of water. It is eaten from the spoon and drinking the water together with it. Victoria: Thank you so much for sharing these memories, Gentiana. It’s fascinating how various cultural traditions blend together, spilling outside the modern state boundaries. For instance, the first time I saw the Persian painted eggs for Nowruz, I was certain I was looking at the pysanky, Ukrainian Easter eggs decorated with colorful designs. Makes you realize how ancient all of these customs are. Jillie: This is perfect for me, thank you! Very spookily I have just made some shortbread which I flavoured with rose – rose must be in the air. And each Easter I make a Rhubarb and Rose Frangipane Tart, so that’s not too far away now. Victoria: It’s snowing?! I hope that it warms up for you, because the forecast for the weekend predicts 20C for Brussels. Right now, it’s around 8C. To be sure, 20C in March is not a normal scenario. Victoria: There might be rhubarb in Eau de Pamplemousse Rose too, but I don’t remember it as well as Rose Ikebana. Also, I just remembered that Neela Vermeire’s Bombay Bling is another rhubarb composition with floral touches, and it’s also fun and sparkling. Patricia: Your photos are so beautiful, I can smell the roses and taste the sharpness of the rhubarb. Victoria: Oh, thanks so much for reminding me about the strained fruit! We usually ate it like compote, with cream on top, but more often, we made it into jam. This is the best quick jam–5 minutes or so of cooking down, no extra sugar is needed, and you have delicious, perfumed and brightly colored spread. And it’s not overly sweet either. The Perfumed Veil: I know, I love them but they are not sweet enough here in Dallas. I love rose jam as well. I used to eat it with tea when I was little. I still get some good varieties at specialty shops. Victoria: My grandmother used to make rose jam, and the moment I think about it, I can almost smell rose petals cooking down with sugar. The only hassle was to pluck the blossoms in such a way as to remove the bitter yellow bottom part of the petals. And then, it took many roses to make one jar of jam, but eating it on a cold, snowy day was the best treat and a reminder of summer. These days, our old rose bush is struggling to survive, and last summer I was able to pluck only a handful of flowers. Not enough for jam, but enough to perfume several batches of tea. rainboweyes: Thanks for sharing this recipe with us! It sounds delicious. I’m sure the syrup will be perfect with champagne or crèmant! rainboweyes: Rhubarb and advocaat are a quite popular combination in Germany, especially for Easter cakes and desserts. And I just found a nice rhubarb and coconut cake recipe. Do you speak some German, Anne? On the website of the “essen & trinken” cooking magazine there are many interesting rhubarb recipes now (including a paprika and rhubarb soup). rainboweyes: The cake is a different one (sort of upside-down cake where the rhubarb gets caramelised at the bottom of the tray) but as it is from the current issue of essen und trinken für jeden tag (e&t for everyday cooking) the recipe is not available online yet. They also have a wonderful poppy seed cake recipe with cherries in this issue, I’ll send you the link as soon as it is online (I know you have a soft spot for poppy seed too 🙂 ). I just placed the link to the soup recipe above but I just found another one with best rhubarb recipes (including rhubarb-orange syrup, rhubarb tirami su, rhubarb ice tea…) Enjoy! Annikky: Wonderful pictures and lovely recipe, I will certainly try it – I was looking at a bunch of rhubarb yesterday and contemplating what to do with it. Rhubarb is popular in Estonia and I think I’ll cook something Persian (one of my favourite cuisines!) this weekend, but supplement it with Estonian teardrop cake with rhubarbs. Victoria: Thank you, Annikky. I would love a recipe for your teardrop cake with rhubarb. Although we had it often at home when I was growing up, our rhubarb repertoire wasn’t that wide, and I’m always curious to try something else with it. There is a great Persian recipe of rhubarb khoresh, a stew with rhubarb and meat, and that’s was a revelation, since previously I’ve only associated rhubarb with desserts. Annikky: Yes, it’s somewhere between a fudge and a brittle and mine has cardamom, saffron, pistachios and rose petals. There’ll be small drops of liquid on the surface when it cools, hence the name. Victoria: Thank you very much, Annikky! I checked out the link and the cake looks delicious and pretty. I haven’t tried this kind of pastry before with rhubarb.